The purpose of this website is to share my discoveries about how to improve health with good food, vitamin supplements and simple hygiene tips. This is based entirely on my own personal research and experience. There may never be a cure for the common cold, but it can be stopped quickly by using the simple method described. There may be no cure for respiratory allergies either. We breathe 24 hours a day, and who knows what pollen or other irritant might be encountered next? Since we now have a technique for stopping the triggers, we don’t need to be concerned with them–whether we know the cause or not. This is not a miracle cure. It is just a way to help your body avoid sending the hook and ladder trucks to take care of a smoldering candle. By stopping colds and allergic reactions, it goes without saying that you can avoid many secondary infections and chronic conditions that might follow. Other conditions for which simple remedies are suggested include headaches, fever blisters, skin fungus, poison ivy, earache and sinusitis. No medications or herbal remedies are required. 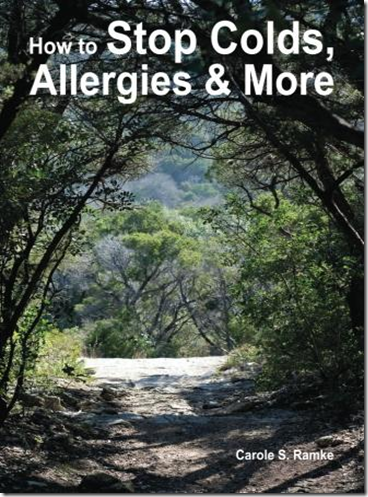 After a lifetime of colds and allergies, the author has been free of both for the past eight years and believes you will find her methods to be easy, inexpensive and very rewarding. My wife and I want to thank you for the cold cure information. She started coming down with a head cold, tried the nip-it trick, and was feeling better in a few hours. When I started feeling bad the next day, she told me to try it (she was verifying it wasn’t a fluke) and what do you know, I was feeling better in just a few hours. We both increased our vitamin C quite a bit too, just to be sure. Anyway, thank you, thank you, thank you! I have had the opportunity to read nearly half of your book and I LOVED IT!!! I plan to purchase one to donate to our Public Library. I am going to have another to pass around to all my “sick” friends, and I have begun marking up my personal copy so I can refer to it often. I am thrilled that someone has finally taken the time to put everyday “cures” in a book. My husband turned to the Vitamin C section right away and said it was very easy to understand.